The study provided a structural equation modeling (SEM) of school leaderships’ views of school emphasis on academic success relative to students’ performances in Trends in Mathematics and Science Study (TIMSS) 2015 in Science and Math in the United Arab Emirates (UAE). The school emphasis was reflected by teachers, parents, and students’ priority and ambition for academic success. The school questionnaire items related to school leaders’ perception of teachers, parents, and students were used for the analysis (13 items). Both exploratory factor analysis (EFA) and confirmatory factor analysis (CFA) were employed to construct the SEM. The SEM provided acceptable fit statistics with several significant paths. Results pointed to the significance of attitudes and behavior of teachers, parents, and students. There were significant paths from teachers to students, from parents to both students and TIMSS scores, and from students to TIMSS scores. The direct impact of the parent construct on the TIMSS scores was elaborated carefully. Implications of the study were discussed along with future research directions. Badri, M. (2019 School emphasis on academic success and TIMSS science/math achievements. International Journal of Research in Education and Science (IJRES), 5(1), 176-189. ISNAD Badri, Masood . "School Emphasis on Academic Success and TIMSS Science/Math Achievements". 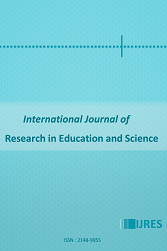 International Journal of Research in Education and Science 5 / 1 (January 2019): 176-189.